Gina Parsonis: Gary and I keep busy with our two private practices and three precious children. We enjoy running into classmates at CEU courses and wished we would have made it to the class reunion! Hope to see you all there in 2014! Christopher Laird: I practice in a hospital-based system where I work inpatient acute and outpatient on a rotational basis. I have a beautiful wife, stepdaughter who is 4-yearsold and one son, who is 15 months. Jeff Schmidt: Orthopaedic and Sports Certified Specialist through the ABPTS. Founder and President of Orthopedic Physical Therapy Specialists, an educational and consulting business for physical therapists. Also part of the Sanford Orthopaedic Physical Therapy residency program core faculty based in Fargo, ND. Shelley Smith DiCecco: I completed my PhD in Physical Therapy at Texas Woman’s University. Beth Douglass: My husband, Jeff and I are enjoying the new addition of their little girl, Evelyn. She was born on April 23, 2013. I continue to work at a privately owned physical therapy company as the Director of Industrial Rehab. Ibrahim Hadge Chapeyama: Private practicing in a rural setting in Maryland, where direct access is feasible. Manual Therapy skills I learned from USA are great skills for an outpatient setting. Scott Love: I have been working part time and now I am going full time with USA in the Flex DPT program. I am moving to Florida from PA on August 1, 2013. Looking forward to sunny weather and being close to campus! Kenny Sargent: I currently live in the Phoenix area and am working with Spooner Physical Therapy, an outpatient PT company. With recent company growth, I am now the Regional Director and oversee daily operations of multiple clinics. Gerry Catapang: I have been working in a private practice since 1999. I just released two PT related DVDs: Self Care For Pain and Headache, and F.I.T. Interstate Trucker Exercise & Pain Management Program. Also launched PT Shirt Online Store: www.myphysicaltherapyshirt.com. Santo Garcia: I was recently elected to the position of Executive Officer – Secretary of the GBS-CIDP Foundation International and head the committee for the Foundation’s expansion into Central and South America. Wendy Smith: I recently got the opportunity to go to Alexandria, VA to be an item writer for the FSBPT. Currently, I am starting back in the home health field, and will continue to work in the outpatient setting part time. 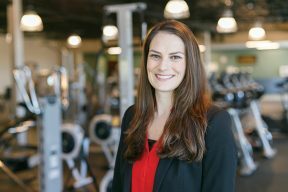 Tammara Moore: I have started a new venture that is wildly successful, a private practice coaching and consulting business for highly committed physical therapists and entrepreneurs. 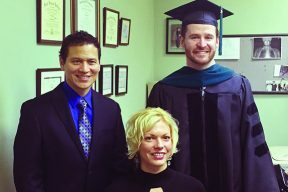 I am passionate to help others succeed, with my 20 years in clinical private practice. We need business skills more than ever in the new healthcare economy. Visit my website at www.drmoorestraightlinecoach.com. Kristen Gillette: We just had our first little girl! Suzanne was born March 1st. Her two big brothers love her to bits! Mandee Kleine (Massay): Matt and I are happy to announce the birth of our daughter. Rylee Kay was born on April 10, 2013. Ruth LaRoche: I am the Assistant Clinical Director of the pediatric home health agency for which I have been working at since graduation. On April 22, 2013, Brent and I welcomed our beautiful little girl, Madison Paige LaRoche, into the world. Michelle Layton: I will be presenting with Rob Stanborough at the annual meeting of the Federation State Boards of Physical Therapy (FSBPT) on dry needling. The program is titled Dry Needling: Where it’s Been, Where it’s Going and Making Informed Regulatory Decisions. Kathleen Golisz: I co-authored the chapter on Cognition, Perception, and Occupational Performance in the 12th edition of “Willard and Spackman’s Occupational Therapy” along with Joan Toglia and Yael Goverover. I also co-authored a chapter on Therapy for Activities of Daily Living in “Brain Injury Medicine” with Joan Toglia. Jeff Miller: In 2011, after practicing in both the outpatient and home health settings, I began teaching as an adjunct faculty member at Seminole State College’s Physical Therapist Assistant Program in Altamonte Springs, Florida. This past January, I was promoted to PTA Program Manager and Academic Coordinator of Clinical Education. Linda Wise: I continue to enjoy my job as an OT/PT in the outpatient setting. My family also has a new addition, our son Brian was born on May 16, 2012. Jill Murphy: I was named the 2012 Wisconsin Physical Therapist of the Year! Laurie Braswell: I am living in Memphis, TN and working at LeBonheur Children’s Hospital, where I am the primary OT for the NICU and infant care units. I love my job and continue to learn new things every day! Carline Dessens: Opened up and settled in as manager of the Spine Clinic at Louisiana Physical Therapy Centers, a privately owned outpatient facility. And anxiously awaiting completion of our new home. Michele Modugno: After graduation, I worked for 1.5 years in an outpatient setting and have recently made the transition to a SNF. I got married in May of 2012 and we are currently expecting our first child in November. Laurie Neal: I have worked in Florida and Louisiana with awesome PT’s, OT’s, and ST’s since graduation. I am currently working for North Oaks Health System in Louisiana, in which I get the pleasure of working in many settings specializing in orthopedics. I hope to soon expand my continuing education to include ASTYM and MTC. 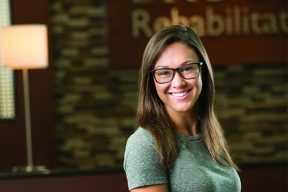 Cristine Drake: I graduated August 2012 and landed my dream employment in February 2013 at the Palm Beach Neuroscience Institute. I am the first PT at this location that has 6 neuro-surgeons, 2 neuro-psychologists, 2 epidemiologist, and a multiple sclerosis expert. There is research staff and an MRI, EEG, and an infusion therapy room. I hope to build the therapy department, start student internships, and receive a specialty in neurologic rehabilitation. John Egbert: I moved to the Seattle area and I am employed at Manual Therapy International, a PT-owned company with a focus on orthopedics and affiliations with Ola Grimsby Institute (OGI). I am also participating in a residency with OGI. Miss you guys! Jason Grammer: I currently work for Eskridge & White Motion Therapy in Birmingham, AL. It is an outpatient, orthopedic clinic which has developed a whole body and scientific-based program designed to optimize a patient’s mobility. Lucus Pratt: I am working at Concentra Physical Therapy as a Staff Physical Therapist, as well as Center Coordinator of Clinical Education for seven clinics in Southern California. I am currently a resident in the Manual Therapy Institute and plan to complete the MTI residency and fellowship program by 2016. I published my case report as a poster presentation at CSM 2013 in San Diego.